The Rice University Music and Performing Arts Center has come one step closer to its grand opening with the recent “topping out” of the new music building for Rice University’s Shepherd School of Music. Approximately 150 people gathered at the building site Sept. 26 to mark this traditional benchmark in the construction process. 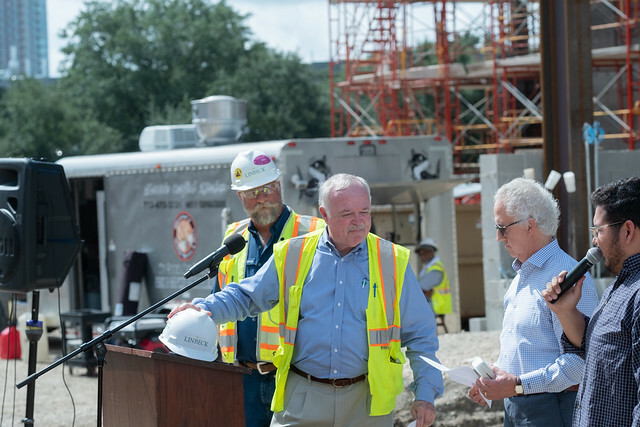 The topping out ceremony celebrated the placement of the last large steel beam in the building that, together with Alice Pratt Brown Hall and an adjoining plaza, will form the Rice University Music and Performing Arts Center. Notable attendees included Robert Yekovich, dean of the Shepherd School; David Stueckler, president and CEO of construction firm Linbeck; Paul Sipes, senior project manager/vice president of Linbeck; Melvin Hildebrandt, former president and CEO of Linbeck; Russ Pitman, one of the project’s principal donors; and Thomas Noble, Michael Tierney and William Costine of Allan Greenberg Architect. To celebrate the momentous occasion, attendees signed the beam before it was lifted into place. “Today, as we celebrate the topping out of the steel in this building, we are especially grateful to all of you for your incredibly hard work and your sustained efforts on behalf of the entire construction team who labor every day to make this dream a reality,” Yekovich said. Before the beam was lifted, Yekovich introduced Angel Vargas, a Shepherd School vocal performance graduate student, who performed “La donna e mobile” from Verdi’s Rigoletto. “We thought in celebrating this milestone today that it would only be appropriate to have a preview of the kind of music-making that will take place in this new theater,” Yekovich said. The venue is slated to open in late 2020 with performances and public events. For more information, visit https://www.rice.edu/rumpac/.